There is not yet a cure for HIV, and the condition is ultimately fatal. Thus, a diagnosis of HIV or AIDS is often likely to have a negative impact on the mental and emotional well-being of those diagnosed. The support of a therapist may be helpful while waiting for test results or coming to terms with a diagnosis of HIV or AIDS. In therapy, an individual can explore ways to cope with the mental health impacts of HIV and AIDS. 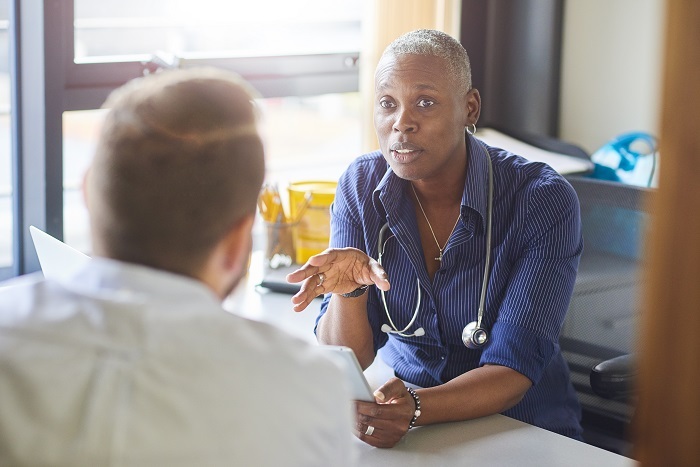 Some mental health professionals may have particular training in treating people who have a life-threatening or chronic illness, and these therapists and counselors may be particularly suited to treat those who have been diagnosed with HIV or AIDS. Family counseling can be beneficial to those who wish to inform their family of their diagnosis, explain what it means, and help family members adapt to the news. Couples counseling may be helpful to people in serodiscordant relationships (relationships where one partner has HIV and one does not). Individual or group therapy can help an individual living with HIV to come to terms with the illness and cope with the challenges it adds to life. Because AIDS, which can develop from HIV, is a life-threatening illness, people infected with HIV may also wish to seek end-of-life counseling, especially as the disease reaches final stages. In therapy, individuals can discuss medically necessary issues with a therapist, make plans for the future for any family members or children who might need care, and come to terms with the eventual end of their life. In this manner, they are able to exercise control over the aspects of life that they still are able to control, as control over the body diminishes. HIV progression may also lead to cognitive impairment, as the virus can affect the brain. Dementia, delirium, and psychosis are some of the conditions that can result, and should any of these conditions develop, a combination of therapy and psychiatric medications may be effective treatment. HIV support groups often focus on developing healthy coping strategies and providing a community for people with the condition. Research connects these support groups with improved well-being and quality of life as well as reduced rates of mortality in group participants. HIV can be passed easily between intimate partners, especially between those who are unsure of their HIV status. It can also be passed from mother to child during pregnancy, childbirth, and breastfeeding. While any chronic illness might have a significant effect on the family and friends of the person who is ill, HIV can be particularly difficult for family and friends to cope with. A person who is infected might depend on an intimate partner or family member for care but might also be reluctant to disclose the illness to family members for fear of stigmatization, which may limit support. Parents may be reluctant to tell children who have been infected with the virus or to discuss safe sexual practices with a teen, though these can prevent further transmission. Those with HIV are also often fairly young compared to other individuals coping with a chronic illness, which may be another factor that is difficult for families and loved ones to face. In a relationship where both partners are HIV-positive and one is dying of AIDS, the healthier partner may also experience survivor's guilt while fearing the eventual progression of the virus in their own body. In these situations, therapy can be helpful. A couple might see a therapist individually, together, or both, and a family therapist might be beneficial to all family members. A therapist can help a family come up with the best way to notify a child or other family member of HIV status. Therapists may also often be able to provide information and resources about the condition. These methods may help some cope with HIV more easily. Being able to mentally cope with the challenges of a chronic illness may also help people have an easier time fighting off physical effects. Coping with an HIV diagnosis: Peter, 38, enters therapy shortly after being diagnosed with HIV. He reports symptoms of depression, an inability to concentrate on his work, trouble going about his daily routines, and fear that his life is rapidly slipping away. He tells the therapist that he worries constantly about developing AIDS, although he has started antiretroviral therapy and has been determined to be in good health by his doctor. The therapist asks Peter about his family and friends, and he reports that he has not told his brother or sister, both of whom Peter is fairly close to, and that he has not told his father and does not wish to, since his mother passed away only three years earlier from complications of multiple sclerosis. His friends have tried to comfort him, Peter reports, but he admits that he had difficulty accepting their affection and sympathy and lashed out at them instead, which has caused him to feel more isolated, as he worries that he has entirely lost their support after pushing them away. In therapy, he begins to explore ways to discuss his diagnosis with his friends and family. The therapist reminds him that mental health is just as important as physical health and encourages him to reach out to his friends and accept their support. Peter begins to develop mechanisms to cope with his anxiety, and he begins to feel more hopeful about his future after several sessions with the therapist. He is able to talk to his siblings and reconnect with his friends, and though he is aware that his life is changed, he begins to realize, with the help of his therapist, that he still has a great deal of control. Knowing Your HIV Status: Why Not Get Tested? How Will I Ever Be Able to Tell Someone I Am HIV-Positive? HIV Prevention and the Role of Therapy: To PrEP or Not To PrEP?